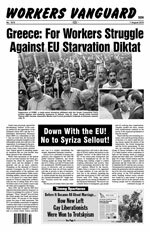 Repudiate Syrizas Sellout to the EU! The following call, which has been translated from Greek, was initiated by our comrades in the Trotskyist Group of Greece on July 17 and distributed in Athens and elsewhere in the country. Repudiate Syriza’s sellout to the EU and the banks. The EU and its currency the euro have been a tragic trap of suffering for the great bulk of the Greek people. The EU and euro must be repudiated. Committees composed of workers from different tendencies and their allies—youth, unemployed, immigrants, pensioners—must be set up throughout the country to struggle for this and toward a government which will act in the interests of the working people and be subordinated to them. This battle cannot be won within a parliamentary framework. We also call upon all like-minded and class-conscious working people throughout the misnamed European Union to support us in our aims and to consider the implications for their own countries. Break with the Capitalists and their Banks! Cancel the debt! Down with the euro and the EU! Rip up the Third Memorandum! For common class struggle of Greek, German and other European workers against Schäuble, Merkel, Hollande and all the EU criminals! Workers defense guards to smash the fascist threat! Defend immigrants against racist attacks! Abolish the VAT and all regressive taxes! Decent housing for all, no evictions! For workers control of food distribution and prices! Abolish business and bank secrets—Open the books! Expropriate the banks, utilities, transportation, ports and shipping industry! Industrialize Greece! For decent pensions for all retirees pegged to the cost of living, now! Quality health care for all! Fight unemployment—Jobs for all through a shorter workweek with no loss in pay! Mobilize now! Hand this leaflet out at your workplace, campuses, neighborhoods, etc. Down With the EU! No to Syriza Sellout!